Water purification and treatment of mineral water before it is supplied to the consumers is a vital process. Equally important is providing clean and durable packaging. GIECL's Pouch Packing Machine is state of the art equipment that can package various kinds of liquids in pouches. 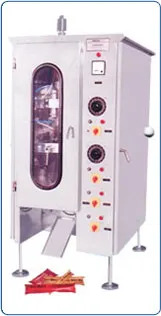 Our mineral water pouch packing machine is fully automatic equipment designed to fill large volume of liquids into pouches flawlessly and at high speed. 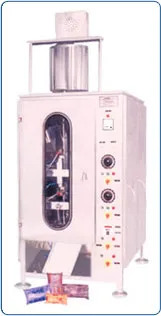 Along with packaging pure mineral water, this machine is highly suitable for packaging milk, butter milk, juices, aerated drinks,liquor and many other free flowing liquids. The key features of this machine are controlled flow and stability that are very crucial in handling liquids. The pouches are designed using best in the business polyethylene film and size can be customized. The mineral water pouch packing machine can fill anywhere from 1000 to 2200 pouches per hour depending on the flow rate and volume of liquid. Complete automation ensures that the process is hassle free and very low on maintenance. Our machine's compact design and user friendly operations are what the clients appreciate the most. Highly Suitable for packing Mineral Water, Milk, Butter Milk, Liquor, Juices etc. free flow liquid.